An upcoming design about western development and exploration of a Trading Post. Land exploration, resource management, and building development included! I’ve been pretty quiet on this blog. In fact, it’s been two months since I posted something. I drastically underestimated how busy life gets with three kids. But I recently started actively designing again. Back in March and April I collated all my designs and realized that I have 14 designs somewhere along the progress train. That was a little shocking. I then decided to focus on two designs and pursue them with great vigor rather than chipping away one small piece at a time. Those two designs that I am focusing on are Trading Post and Ziggurat. Today I will discuss some of the concept of Trading Post. Do I finally have a fun game here? Trading Post was my second ever design concept. I began working on it when I had absolutely no idea what I was doing regarding design games. (Some might still think that’s the case). But now I’ve redesigned it from scratch and I like where it is headed. The theme of the game revolves around the Fort Union Trading Post. You can learn more about it on the National Park Service site here. The trading post at Fort Union was requested by the Assiniboine Indian tribe. All the local tribes and the inhabitants of the fort were friendly with one another, so the game includes no conflicts with the tribes. This is thematic and accurate. This image is purposefully not very revealing. The game utilizes a rondel for action selection. It is a resource collection and management game. Players earn the most points by getting higher level resources via trades and then trading those higher level resources with Indian tribes. The focus of the game is completing trades. I suppose you could put them in the same boat as the recipes in the Chili Cook Off in Scoville. They fit that mold. But in Trading Post you have to do a bunch of legwork to get the resources that are needed for those high level trades. And to get those resources you will have to manage your actions in the most optimal way. There are eight action locations on the rondel. Four of them offer resources or trading abilities. The other four offer “experiences.” The experiences include hunting, encountering Indians, and building the fort. To hunt you will need guns. Encountering Indians is one of the higher level trading options. And building the fort will reward the player with the greatest number of points as it also determines when the game ends. The whole premise is to contribute to the building of the fort. The best way to contribute is by completing trades that give you the resources with which you can build. Why is it that the “In My Head” concept step always seems so perfect until I actually get the game to the table? Honestly the best step any game designer can take in figuring out their game is to make the prototype and play it. I liken that step to completing the border of a puzzle. Once you have the border completed then you have a better idea of what you are actually working on. So I solo tested Trading Post the other night. I now have my border in place. After solo testing I realized that I needed tiers to the resources. This is similar to the idea of clay and brick in many Uwe Rosenberg games. The clay is a standard resource and the bricks are advanced resources. So I am going to implement a tiered system in Trading Post. I also learned that the Indian Encounter trading objectives are too focused. Rather then requiring absolutely specific things, like two knives, they will require a more simple objective, like a pair of cards. This should help players complete those objectives, provide rewarding moments in the game, and allow the game to move more quickly. The other thing I want to really emphasize in the game is player interaction via player to player trading. Right now I have a simple mechanic like the trading in Catan but I want to step it up just a bit. I’m still working on this and I’m hoping it falls into place when I have a few more pieces of the puzzle together. So that’s the latest from me. I’ll post a similar article about Ziggurat probably next week. My goal for both games is to have them past the solo-testing phase so that I can bring them to Gen Con and get feedback from awesome people like you. Thanks for reading. Today I’m giving you some bonus material on where the game is at, how to make it better, and some other tasty morsels. But let’s start with how good I am at focusing on things other than actually designing this game! One of my downfalls in life is my desire for perfection. Perhaps perfection is the wrong word. That paints me as someone with OCD, not that there’s anything wrong with that. Perhaps a better word would be aesthetics. I desire for things to look good. At the end of May an article was posted on Example of Play called, “The Benefits of Crappy prototypes.” I will provide a rebuttal for that article next week, but I wanted to mention it today because I am not a believer in crappy prototypes. And this may be my downfall. I love a good looking prototype. I love good game art. If you’ve read my board game reviews you’ll see that artwork is consistently mentioned as either a like or a dislike. I approach game design as though I’m reading a story. I like to be enveloped in a different world and escape this one for an hour or so. Artwork is a key way to get that experience across to the players. The downside is that I have four logos (as seen above) for a game that no one has yet even played! I just can’t help myself. Games, and game design, are supposed to be fun! Why else design games or play them? So I’ve realized that though the artwork doesn’t specifically help a game design move forward, I’m having a lot of fun working on the artwork. Thus, I shall continue. 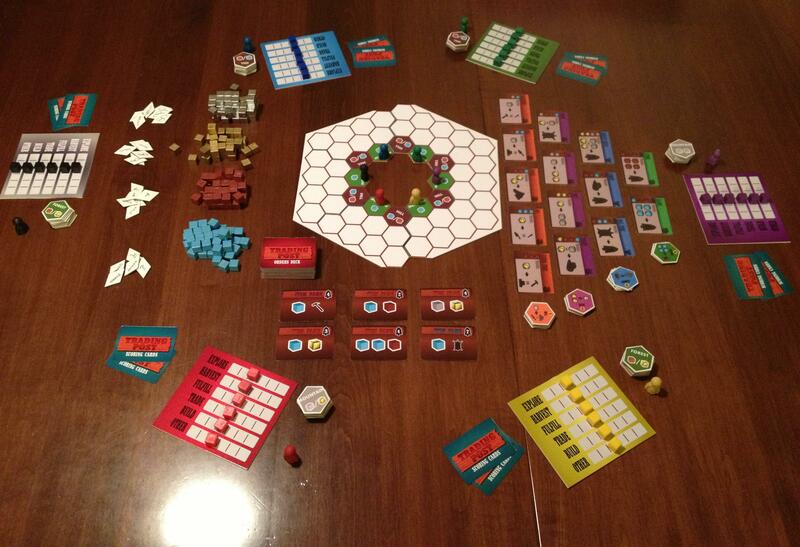 Current Trading Post prototype. I think it at least looks cool! Since this is an insight into the inner workings of my mind I am sharing the thoughts I wrote down while attempting to play the game for the first time. First, some rules. On your turn you can take up to 3 actions. These can all be the same, or they can all be different. That’s up to you. The actions you can take are determined by the number of action points you have for each action. For example, if you had three points in the EXPLORE action track, then you could use all three actions on your turn to EXPLORE. After you have taken your 1, 2, or 3 actions, you must then move other action’s track cubes up in value. This is what I am calling a “Zero-Sum Action Point Allowance System.” (I would go with the acronym ZSAPAS, but I’m not going to use the term again in today’s article). Basically, for every action you take there is an equal an opposite reaction. During testing, if it seems like the first turn for all players is dictated, SKIP that first turn and make the result the new starting condition in the game. What that means is that if all players have no choice (or only one beneficial choice) for what their first turn should be, fix it! Ever wonder why players start with 4 train cards in Ticket to Ride??? After 6 turns I had been unable to fulfill any orders and I was only able to purchase one building. In Scoville players only have a total of about 7-10 turns. So after these 6 turns I realized that I have basically done nothing. At least nothing very fun. I need to adjust it so players feel a sense of accomplishment on each turn, or at least feel like they are setting themselves up for accomplishment soon. Should the highest valued Order card be replaced each turn that an order is not fulfilled? It takes too long to build even the basic buildings, which means it takes too long to get the man-made resources. How can this be sped up? Should players be able to complete a trade even if their pawn is not on a spot with another player or in the Trading Post (a la Settlers of Catan)? How do I make TRADING the focus? Put the “Trading” in Trading Post! Thus far in the design the trading aspect of the game has, for some lame reason or another, been the lesser focus of the design. I have always been more interested in the land exploration and development side of things. Why? Designers should step back from their design every once in a while and pick apart every aspect. Ask yourself specific questions about each design decision and try to think if there is a better way! One big example is when a level 1 friend pointed out that the black and white peppers in Scoville should cross-breed to silver/platinum/other grey color rather than gold. Color-wise it made sense. But since my original design was that they made gold I had simply stayed with it because I had never gone back and questioned why I did it that way. And I never asked myself if there was something better. So the new thrust of the design for Trading Post is to bring trading to the forefront. Now I think that on every turn you will complete a trade at the start of your turn. This could then aid you when you choose your three actions for your turn. I’m imagining a “Trade Route” of trading cards on the table, which would still represent things the Trading Post needs. They could be set up like the races in Small World or the foraging trail in Morels or the buildings track in The Manhattan Project. In each of those games players can choose the first option(s) for free or pay to take one further done the path. This mechanic would work very well for the “Trade Route.” Or I could use a rondel for increased Euro-y awesomeness! Another way that trading would become more integral, and increase player interaction at the same time, is to allow trading with other players no matter where you are located. Sometimes it’s easy to let thematic correctness run the show. But this is game design and we can fudge things now and then. Settlers of Catan is a very popular game that allows player to trade resources with other players no matter what. Now, explain thematically how that makes sense. What if your settlements and their settlements aren’t anywhere near each other on Catan? Well, if it’s good enough for Catan, then it’s good enough for this game! The bottom line is that trading needs to be what makes this game special. If you want a game where exploration is the focus, then find some 18XX game. A game is in there somewhere… I just have to find it! So I am going to jump back a little and try to re-figure out how to play this game. Admittedly it wasn’t ever really set to begin with. But to make trading the focus will take some effort. I really think this can be a fun theme/game and so I will continue to work on it. So it’s time to take some of the blank cards I ordered and put them to use. 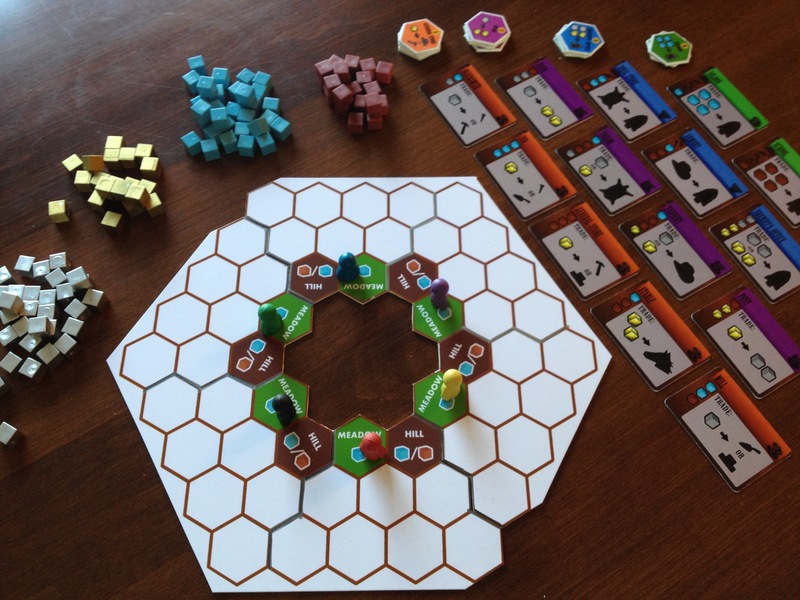 I’m excited to work on the Trade Route/Rondel idea and see how it changes the focus on the game. Another thing I’ll probably change is that players should draw all their land from their set of ten land tiles as part of their setup. What this would do is drastically lower the exploration aspect of the game. Players would also be able to plan their moves more deeply and more intentionally. I like the sound of that. Once I nail down how I want the trade route to work then I can put the pieces back together for how the rest of your turn would work. This should be pretty interesting and I’m going to take an open-source approach to this design. That means I’ll be posting about it for all of you to read. I hope to provide you with a designer’s perspective on making appropriate choices within the design process, and how to keep things simple. Trading Post posts likely won’t be weekly from here on out, but they will definitely pop up now and then as I work through stuff. Thanks for reading and joining me on this ride! 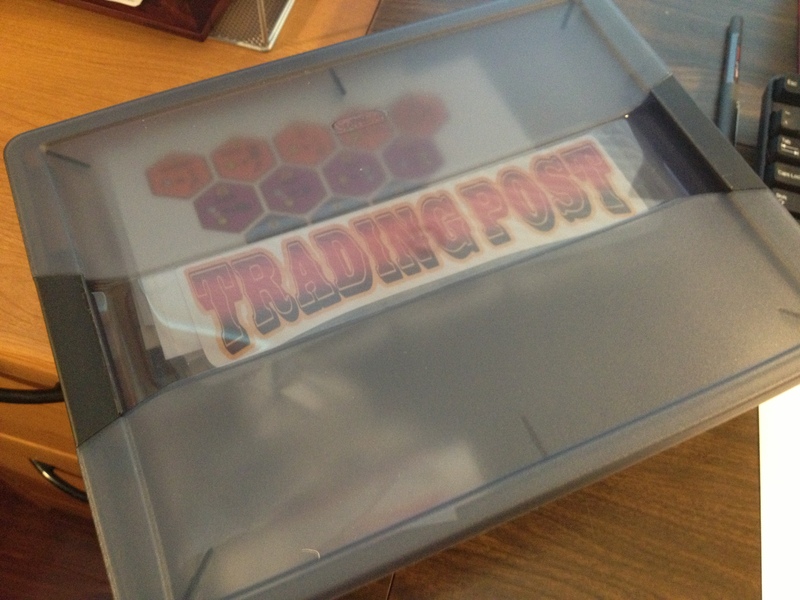 Today we’re looking at my path forward with Trading Post as we near GenCon. I am hoping to have a game that has been playtested, is fun, and is able to be played near the Blue Noodle (UnPub area). So I’ll cover some development and what I’m hoping will happen with the game. So let’s talk about the different components that we see in that picture and discuss their purpose in the game. Let’s start in the middle and work our way out. In the center is the land portion or map portion of the game. Each player has their own region, which is shown on the right. It is a player’s objective to explore their territory throughout the game. As they explore their territory they will draw a tile from their land tiles. These tiles are shown in the image above as the stack of hexes next to the player mats. The tiles will be either Meadow, Hill, Forest, or Mountain. On the right of the map portion is the tree of buildings. Besides exploring your territory during the game you will also want to build buildings. The downside of building is that you lose a resource region of your territory. The upside is that you have a new trading opportunity in your own territory. 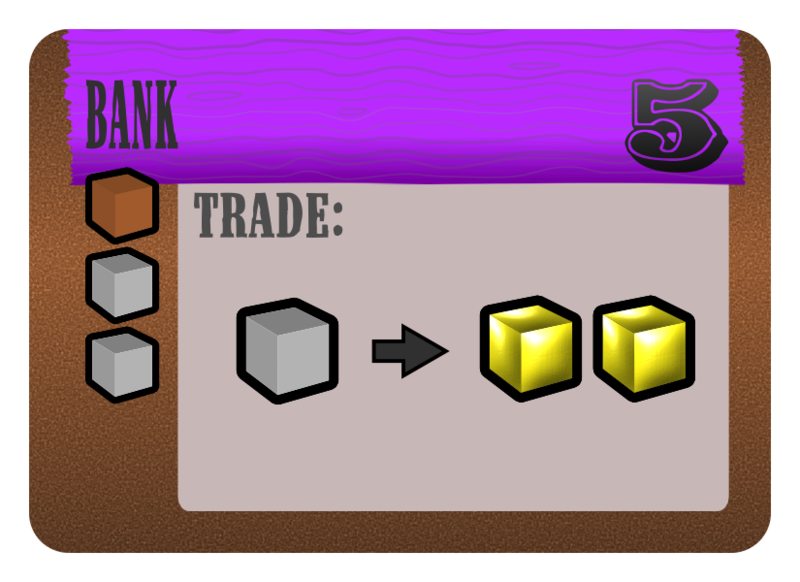 Other players may visit it to complete the trade shown on the building hex, but they will have to pay you to do so. Buildings also count towards some of the scoring cards, which I will explain below. To the left of the map portion are the resources. There are four natural resources in the game and four man made resources. The four natural resources are gained by harvesting them within your territory. The man made resources can be earned through the trade opportunities in certain buildings. Example of a “Blue” order. This requires a Water and a Hat (Fedora?). The player earns 7 points. Below the map portion in the image are the Orders cards. Thematically here the Trading Post is requesting certain orders to be fulfilled. On your turn you have the opportunity to fulfill any number of these if you have the action points available. Along with building buildings it is also critical to fulfill orders during the game. This is a significant way to earn points. It is also a way to earn endgame points if you have a scoring card that requires certain colored orders be fulfilled. Once orders have been fulfilled, at the end of the current turn they are restocked to the number of players. In the image the game is set up for six players. 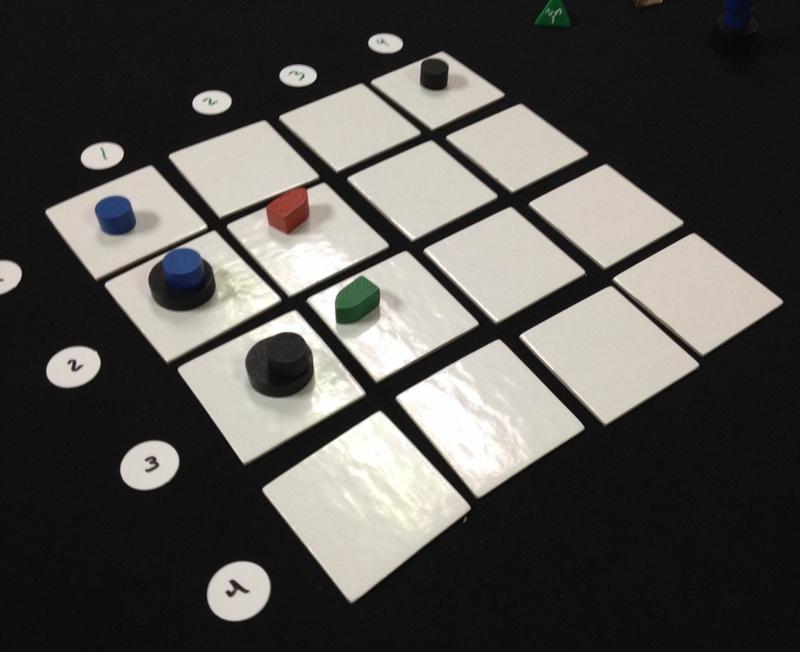 Each player has a player mat, their ten territory tiles, a pawn for the scoring track that is not in the image, and two scoring cards. Each player will also have some coins to begin the game, but I have not yet totally figured out the role I want coins to play in the game. They may ultimately be excluded. Scoring cards represent hidden endgame scoring conditions. These are similar to the route/destination tickets in Ticket to Ride. Some of these are requirements for building certain combinations of buildings. Others are for fulfilling certain combinations of orders. But they are all ways to score points at the end of the game. I chose this because I like all players to be able to hold on to hope. And endgame scoring is a mechanic for hope. The player mat is where I think a lot of the interesting strategy comes into play. The mats in the picture do not have numbers on them, but you can imagine each row having 0 1 2 3 4 5 on them. Each row is a different action. The number on which your cube sits tells you how many of that action you have available on your turn. At the start of the game all players have two of each action available. On your turn you can do three different actions, each as many times as your cubes indicate. The cool part is that as those actions decrease, other actions have to increase equally. What we have here is a zero-sum action point allowance system. Here is an example of a first turn where the player has chosen to EXPLORE twice and HARVEST twice. This allows them to discover new parts of their territory, set themselves up to have more resources available on subsequent turns, and have some resources to use on their next turn. So they spent a total of four action points. Then they have to move non-used actions up by four points. In this case they chose to increase FULFILL by 1 and TRADE by 3. Player performs EXPLORE and HARVEST twice each. Then chooses to increase FULFILL one spot and TRADE three spots. On their next turn they will be unable to explore and harvest. So likely their only option is to move their pawn to the Trading Post and hope they can fulfill an order or perform a trade based on the resources they harvest on their first turn. I think having this zero-sum action point allowance system in place will lead to some tense decisions in the game. Players will have to make sure they’re leaving themselves with the action points they want for the next turn. The first time I tried to play Scoville it played through to the end in a surprisingly well manner. I am a little worried about that with Trading Post. I feel like this will require much more testing than Scoville to get it to a point where I am comfortable showing it to a publisher. But GenCon is two months away, so the testing shall commence soon. My main objective with any playtesting is to continually make sure the game is any fun. It’s all about fun, right? Who wants to play a boring, crappy game with some weird, offbeat theme that doesn’t relate to anyone? Now, perhaps there are a bunch of you who think the western trading post scene is for old guys who grew up watching John Wayne. I can assure you that in Trading Post out here a man settles his own problems. Trading Post is designed with a Euro identity in mind, but without anyone from the 13th-18th centuries looking boring on the cover of the box. I am very excited about this game and its potential. Perhaps the most important step in the Game Design process! I am fortunate to have a great group of friends who are willing to playtest my games here in town. So I am guessing they’ll try out this one as well. Since playtesting will be my focus for Trading Post over the next two months I figured I would list the things that I view as important during the playtesting phase of game design. Keep your design objectives in mind – do not get carried away on wild tangents just because one player mentioned something unusual. Keep asking yourself why you are designing this particular game and why you think it is unique and interesting. Offer bribes of beverages, snacks, and an awesome atmosphere to lure playtesters. And telling them their name would be in the rulebook if it were to get published doesn’t hurt either! Try to make sure the game is playable before subjecting anyone to it. This means solo playtesting. Don’t change major things on the fly during a playtest. Don’t implement more than one major change at a time between playtests – if you add two things and the game gets way better or way worse you may not know which change should be attributed to the difference in play. I recommend playtesting at least ten times before integrating major changes. This gives you a solid pool of plays from which to draw an understanding of an “average” game and also gives you enough opportunity to perhaps see any unusual play. One of the keys to playtesting is watching for patterns. If several different people all mention the same thing (not in the same playtest) then you’d better start paying attention to it. And I’d like to recommend shooting for a playtest goal of 100 playtests, but I’ve not done that with my games, so how could I hold you accountable. Do it! I don’t. You should. So 100 it is! If your design is complex, playtest the game ten times and only focus on one element. Make no changes to anything else. Once that element seems “good,” move on to another. I think I will have to proceed this way with Trading Post. I may start by watching how the buildings get purchased and built for a set of ten playtests. Then for the next ten I may focus on how the scoring conditions seem to play out. 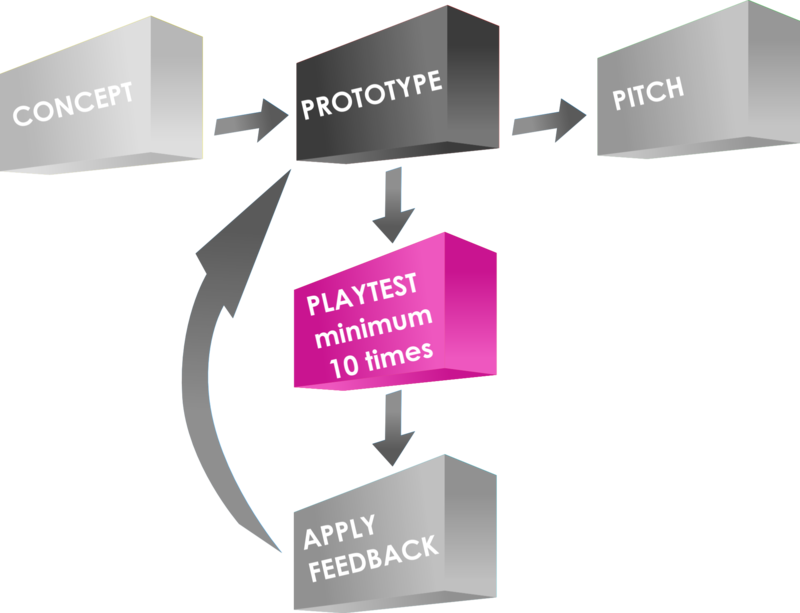 (Note: the data from the first ten playtests where scoring conditions were not the focus can still be used in this portion of the playtesting). My goal over the next two months is to get 15 playtests completed. That’s one every four days, which might be a bit much, but you gotta have ambition if you wanna get anything done! Entering Protospiel-Milwaukee I had had 18 playtests in on Scoville. By then, even with only 18 under my belt, I felt I was able to teach it quickly and explain the thrust of the game. That way I was not wasting other playtesters time. I hope to meet this goal so that I don’t waste anyone’s time at GenCon where there is so much awesomeness to be had! Well I’d be a knucklehead if I assumed that a game that hasn’t even yet been played could be pitchable by GenCon. That will depend on how playtesting goes. So I am not going set of goal of pitching this game while there. My goal for moving forward with this game as GenCon approaches is to have something where the wrinkles have been ironed out and it seems fun. The first is something you should probably be working on right now if you haven’t already done it. The second is an awesome guide to how it all works and how to do it right. I’m guessing my 2014 GenCon will be more about pitching than my 2013 GenCon. Now I just gotta sucker my friends into playing an unpublished game that likely has no balance, and no reason to be good. Of course I’ll have to figure out those insignificant things like what you actually do on a turn. But I’m getting very close to solo testing. If this game seems to work after a decent amount of playtests then I’ll likely send a copy into the Prototype Penpal Program run by Grant Rodiek. It’s a great way to get designer level feedback and to see if your game is broken. Plus, it’s always fun to know that somewhere out there other people are playing your game! Well I hope you’ve enjoyed my articles over the past few Thursdays about Trading Post. I’ve received some interesting feedback already and I appreciate all the kind things you’ve all said. I hope that this game seems fun to you. I’ll keep moving forward with it and will definitely keep blogging about it. Someone also suggested making Thursday the default Trading Post day. We’ll see. Thanks for reading! And don’t be shy with any comments about any of this. Redesigned Logo… Let’s just redesign everything! Today we’re looking at the current state of the game, and how I got there. In my opinion today’s article covers the most important details of game design. 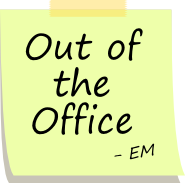 Let’s call it “distilling” and “skimming.” But first let’s look at why I took a break from the game. If you’ve read the past two articles on Trading Post then you’ve learned what I want the game to be like (week 1 – Origins), and you’ve learned how I don’t want to be (Week 2 – Early Prototyping). At its heart I want Trading Post to be a competitive game about exploration and development of a western Trading Post. I want the game to flow smoothly, create tense decisions, feel thematic, and be easy to teach/learn. My previous version was none of those. I had spent a lot of time on this game. I thought I had something very thematic. But I realized that I had a big pile of garbage that didn’t work together. It had several things in it that felt like busywork rather than a game. And ultimately it was not any fun. That’s a huge problem. Remember that we are game designers and games are supposed to be fun! So I decided to put Trading Post on the shelf. That must have been early in 2012. At the time it was a pretty easy decision because I really didn’t know how to move forward with the game. I could easily have abandoned the project overall. During the hiatus I worked on a few other games. The most notable (at this point) was my card game Dam It! But I was working on another game with a level 1 friend. It used several of the same elements of Trading Post but in a more thematic and historical context. Ultimately I realized that Trading Post was a game I wanted to bring back. To resurrect. So after having Scoville turn in to the PnP behemoth that it has I figured now would be a good time to try and bring back Trading Post from the dust in my basement. There were certain elements that I thought would be good to carry over from the first version of the game. And there were others that I knew I should ditch. I figured a good way to redesign the game would be to start with the elements I wanted and add from there. I could then completely ignore the bad things from version one. My starting point was the land exploration portion of the game. I knew that this could be dramatically simplified. To get things more simple I decided that the game would have only four natural resources – Water, Lumber, Stone, and Gold. The previous version had more – Lumber, Grain, Animals, Fruit, Cotton, Steel/Iron, and Water. That was too many. And four would allow me to do what I want with the game. Each player has a set of these ten tiles, 7 of which will fill their territory. 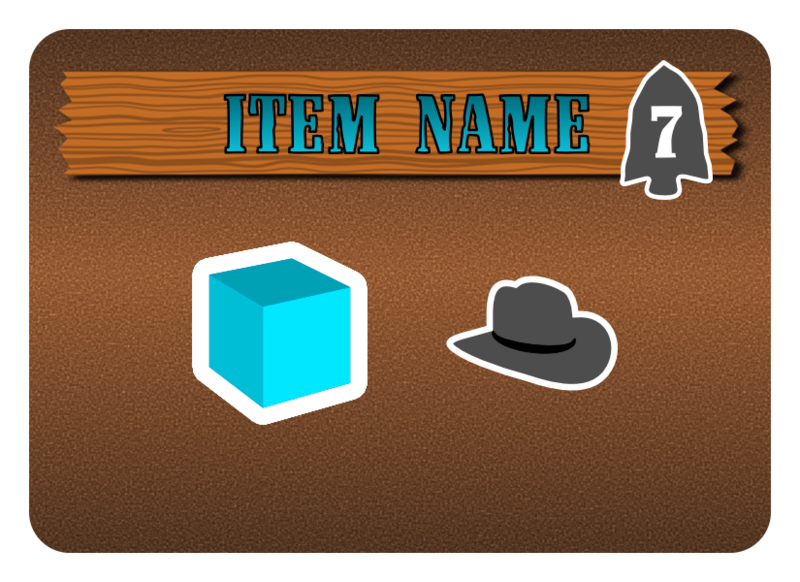 Players will add these to their portion of land that the Trading Post has given them to explore. Each player starts with a Meadow (1 Water) and a Hill (One Water OR One Lumber). With this design players will always have access to all of the resources. Sometimes players may end up with all four mountain tiles and thus a bunch of stone. Likewise players may end up with only one mountain tile and thus very little stone. Each player starts with a meadow and a hill. Therefore they have access to water and lumber. With the understanding that some players may have only one gold tile or stone tile while others may have four stone tiles or four gold tiles I knew that I’d have to design the game so that you can win under any of those conditions. That leads me to my next design element that has carried over from version 1… the buildings. In the original version of the game the buildings only entered into the mix late in the game. They acted the same way as the Orders – that is, they came out four per year and you could fulfill them from the pool of face up cards. I didn’t like that. Bank costs 1 lumber and 2 stone. Can trade 1 stone for 2 gold. Builder earns 5 points when Bank is built. So I decided to make buildings a more integrated part of the game by allowing them to be entered for some benefit to a player. Also, I decided that buildings should be available from the start of the game. Thematically the idea of building buildings is that you are developing the Trading Post so that it offers more to any guests that may visit. So buildings are a part of the game play from the get go. There are 14 different buildings in the game. Each building offers players some sort of trading opportunity. Players can purchase buildings and build them on their land. Once they build a building they will earn points for building it, but will also cover up the natural resources that they could produce on that territory tile. 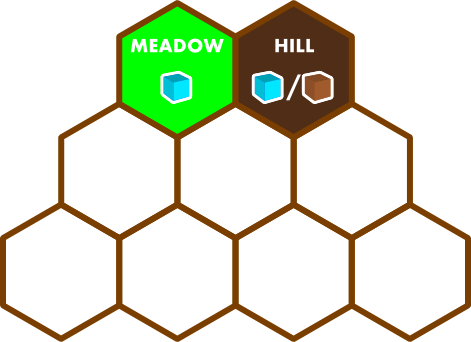 When a player purchases a building they will take the associated hex for that building and place it onto a section of their territory that they have already prepared for a building. Note: preparing land is a separate action. Whenever another player enters the bank tile, the owner is to be paid two coins as a sort of “trade fee.” These buildings will be critical to success in the game. You want to own them, but you also don’t want to give up the resources of the land that they are covering. It’s a sort of Catch-22. But that’s part of the fun of a game, right? My objective with the design of the buildings was to utilize both stone and gold equally. This would aid the differing land resource conditions that I mentioned above. As an example, there is another building where you can trade one gold for two stone. Imagine owning both that building and the bank! You’d be able to create a huge supply of both stone and gold. Now that I had redesigned the buildings in a much simpler manner that will be more integrated into the game play it was time to give players options for scoring points. And it made me ask the very important question that I seem to neglect until the late stages of game design: How do you win the game? Let’s Get to the Point(s)! I struggled a lot with how I wanted scoring to be handled in Trading Post. So far we’ve only discussed earning points via buildings. In the previous version of the game players could earn points from fulfilling orders. I wanted that element to remain in the game. But I also wanted more opportunity for scoring. And I wanted that scoring to be hidden. This mechanic is the core of the famous game Ticket to Ride. In that game players play the game and attempt to complete routes from one city to another. They are the only person who knows the route. At the end of the game the routes are revealed and players score positive or negative points based on whether or not they connected the two cities. You Can’t Order Me Around! That is exactly what I’ve been doing with these game elements. I am extracting the parts of the elements that make sense and work as a game. You could also look at it like separating the wheat from the chaff. Version 1 had a lot of chaff and very little wheat. But the wheat that was there was very good wheat. I recommend to all game designers who have projects that they’ve shelved to try and distill them. This is a great way to get back to the core elements that you originally desired while removing the garbage that you added needlessly. Fulfilling this order requires 1 gold, 1 bricks, and 1 trowel. So I took the concept of orders and basically “Mathified” it. What I mean by that is I basically designed the orders to be different combinations of the resources used in the game. Version 1 had a huge list like the spreadsheet that I showed last week. These were things like hats, pies, and musketballs. I decided that with the redesign I would ignore the naming of the items and just use the mathy combination of things. So there are orders that cost 1 wood or 1 lumber or 1 stone or 1 gold. Then there are orders that cost any combination of two of those resources. 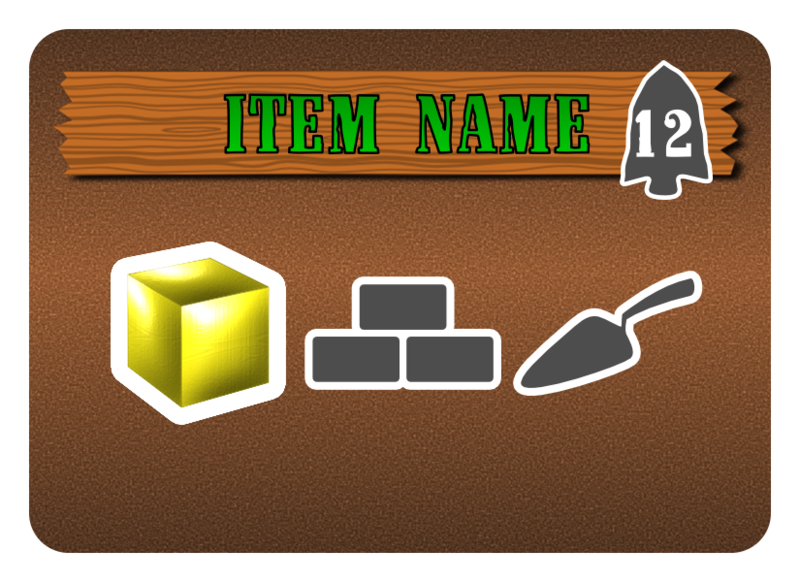 Then there are orders that add in the secondary resources (hammer/nails/bricks/trowel). And it gets more complicated from there. You’ve Got a Hidden Agenda! The other scoring I mentioned is hidden scoring. There are many games that have scoring conditions that are revealed at the end of the game. So I’m not doing anything groundbreaking here. But having hidden scoring conditions that only get revealed at the end of the game is a great way for players to never feel out of a game! Hope is a big deal in board games. If a player doesn’t think they can win they may as well give up. I’ve seen players who know they can’t win start to help their favorite player win the game. I do not like that in a game. If a player has hope that they are doing a great job meeting their own scoring conditions then they have hope that they could pull it out in the end. Games like this include Stone Age, Archipelago, Ticket to Ride, and Suburbia to name a few. Goals are also important. It helps guide a player’s strategy. It gives a player something to plan for. And it can help eliminate analysis paralysis. One of the newer games that has goals that definitely guide my strategy is 7 Wonders. In 7 Wonders each player has their own “Wonder” which is shown on a player mat in front of them. Each of these is different and provides some sort of bonus. The wonder that you receive can steer your strategy in the game. I designed a deck of scoring condition cards to meet those requirements. These include having certain sets of buildings or certain combinations of fulfilled orders. So players can have hope throughout the game and never feel completely out of it. They may not be totally thematic, but I can give up a little theme for a better game. If players want to think of these scoring conditions more thematically then they can think of them as private commissions from the Trading Post. Here are two examples of scoring conditions. The card on the left would award points to the player only if they managed to own two blue buildings and a green building. The card on the right would award different numbers of points based on how many orange orders they fulfilled. Left: a “Buildings” scoring condition. Right: an “Orders” scoring condition. But How Do You Play? Role Selection a la Puerto Rico, Race for the Galaxy, Carson City. Turn based game play with players choosing one thing to do per turn. Turn based with an action point allowance system. Rounds where players each do action A, then action B, and so on. So I’m going to choose the game play option that best fits those game design goals. I am initially leaning toward the role selection option but making it less about a role and more about providing a specific set of actions that a player can do. I’m not sure that makes sense. The current state of Trading Post minus half the components. The bottom line is that I have several game play concepts within the game but I don’t have an overall picture of the game play. That’s what I’ll be discussing more in depth in next week’s article about my path to GenCon with Trading Post. So next week I’ll cover the game play options for the game. I’ll also cover how to get this game ready to potentially pitch it to publishers at GenCon. Stay tuned! As usual, your comments are welcome. I’d love to hear what people think about this game design.